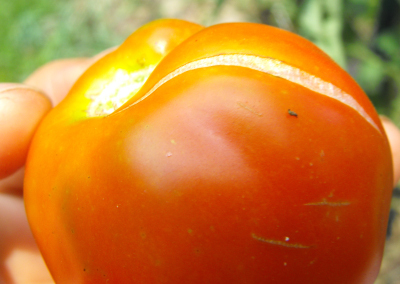 Cracking is probably the most common tomato blemish out there. Like blossom end rot, split tomatoes are often the result of improper watering, but the symptoms usually show up when the fruit is closer to maturity. At a certain point in the tomato ripening process, your fruit has achieved its full size and it toughens up its formerly stretchable skin. If a heavy rain soaks the soil after the tomato epidermis hardens, the tomato can swell up further and crack its skin. Alternatively, cracks sometimes occur when hot days are followed by cold nights, causing the skin to expand and then contract quickly. My advice is about the same as it was for blossom end rot --- mulch if you're worried --- but I tend to think that cracking is just an inevitable fact of life. I cut out hardened cracks and just eat soft cracks. Life's too short to throw out a delicious tomato just because it has cosmetic damage! Sick of the rat race? Explore your options with Microbusiness Independence.